Fantastic news! Since I’ve been veggie for a good 16 years now, you can start shipping me some organic oranges whenever they’re in season, then. But where can I get more detailed info on whether it’s better to get them from California or Florida if I live somewhere in the middle? I suppose the only honest comment I can leave on this one is that I have forwarded this to both siblings and co-workers who have had this exact question in recent months. (And now for some ridiculous homophony:) I’m hoping the question comes up again during the next office meating. In fact, if you guys would ever like to come in for a visit, I think everyone would like to meat you. I promise it won’t be murder, because murder is illegal, and if we did it, then we’d be on the lamb. And lamb is bad. Thank you! This needs to be publicized more. If you are going to eat animal products, try to get pasture-raised (or grass-fed) meat, dairy and eggs. 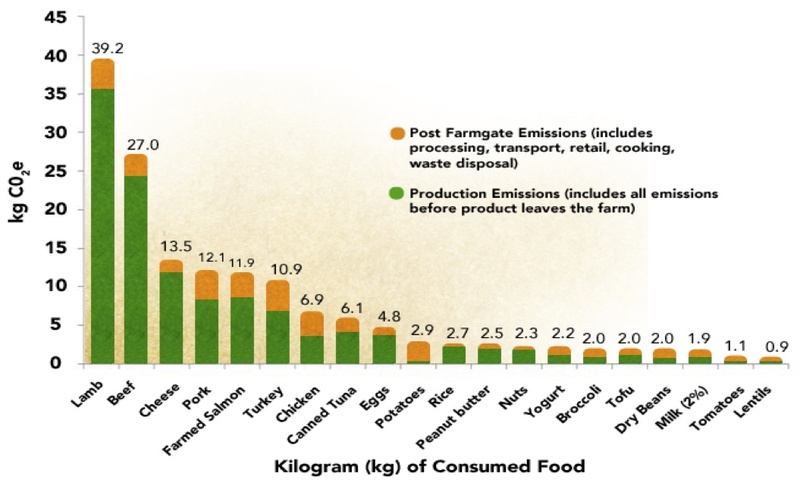 Most of the calculations of climate impact are based on grain-fed animals, since most animal products in the US come from animals raised in feedlots on grain. When animals are raised on pasture, their meat, milk and eggs are much more nutritious (with more omega-3’s and CLA’s, the “good” kinds of fat), and at the same time the grassland can sequester much more carbon than a field of grain (or the soil of the feedlot) would. One study suggests that this carbon sequestration could offset as much as 94% of the carbon footprint of beef (http://www.bestfootforward.com/casestudy/national-trust/), making grass-fed meat a much more sustainable option. We have questions about biochar/charcoal. How many gallons of charcoal do I need to mix into the soil to offset the CO2 from burning one gallon of gasoline? And does the charcoal help any plants grow better?